I saw a great movie (on video) recently called Arranged. It’s about two first-year teachers, one Orthodox Jewish and the other Muslim, who become best friends. The story follows them bonding over their experiences being matched for arranged marriages, as well as facing tension at work from coworkers regarding their religions/modesty of clothing, etc. This movie does a beautiful job of showing the beauty of their faiths, cultures, and experiences. I highly recommend it. Once you finish sewing the rows together, you will need to sew on an outer border. I used the same material for the outer border and backing, which was a black fabric with colorful circles. I cut 5.5 inch strips of the outer border fabric, and then sewed strips together to make 2 strips the vertical length of the quilt. I sewed those to the sides of the quilt, and then made 2 strips the new top and bottom width of the quilt. I saw new, because after adding the side borders, the width of the quilt became wider. Once you have sewn the top and bottom strips to the quilt, your quilt top will be complete! Your next step will be to mark the quilting lines. Sometimes, I layer my quilt before I mark quilting lines. This time, I found it easier to mark the lines beforehand, which allowed me to mark the quilt on a smaller table, instead of crawling around on the floor. I made diagonal lines that went from corner to corner through each square. Then, I made additional diagonal lines halfway between each diagonal line. I stopped my lines at the outer border, because I like to do a decorative, wavy quilting stitch on the outer border. Once you have your quilting lines complete, sew 2 pieces of backing fabric together lengthwise. Make sure each piece is the length of the quilt, from top to bottom. This way, your backing will be wide enough to accommodate the width of the quilt. After your backing is complete, put your backing wrong side up on the ground, then add your batting, and then place your quilt top right side up on top. Smooth everything out and pin it together. Other options include stretching everything very tight, taping pieces to a large table to omit any wrinkles, basting layers together, using quilting spray adhesive to stick layers together, etc. After your quilt is sandwiched together, quilt along the quilting lines. Next, trim the batting even with the quilt top, and then trim the backing about 1 inch wider than the quilt top. Fold the backing over and sew it down. Now, your quilt will be complete! 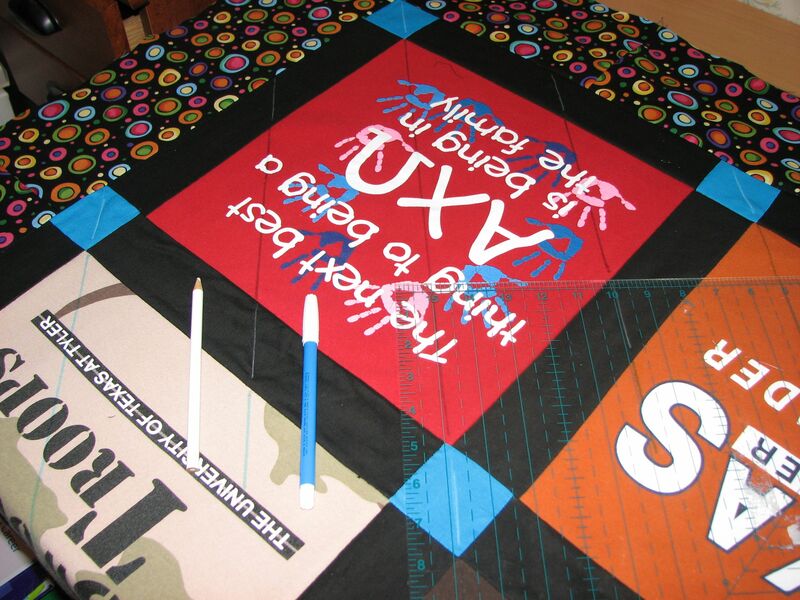 The above picture shows the top two rows of the quilt, after they have been sewed together with a black strip/turquoise square row in-between. I also put a strip/square row on top. The above picture is the bottom half of the quilt. It looks very similar to the top half! 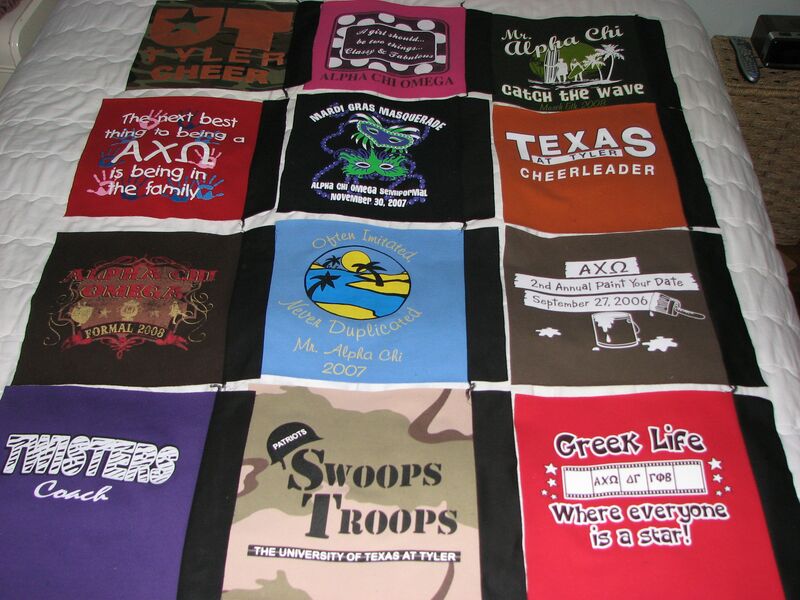 Like the top half, you alternate t-shirt rows with strip/square rows. Since this is the bottom half of the quilt, you will also need to sew a strip/square row to the bottom. As you sew the rows together, you’ll be pressing the seams open. I would recommend that you use a pressing cloth. If you don’t, your iron might not glide well over the fabric or the iron might remove any screen-printing and smear it over the rest of the fabric. You’ll need to sew a black fabric strip to the right-hand side of each t-shirt square. Then, lay out your t-shirts in rows of 3 to decide on your layout. The above pic is Layout #1. Layout #2 is the picture above. I went ahead with Layout #2. It’s important to take a digital photo (camera/cell phone) or write down your layout, because once you start sewing shirts together, you’ll probably forget what went where. 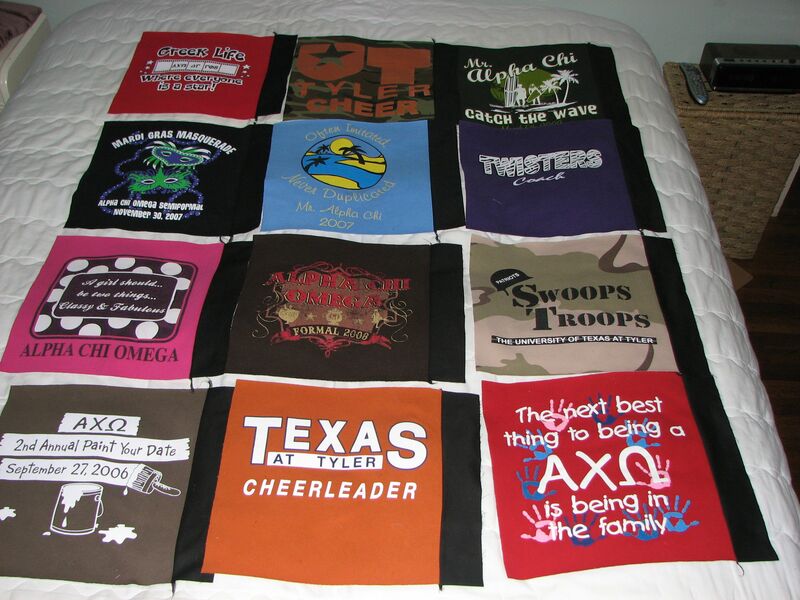 Once you have your layout, sew the t-shirts together in rows. You will have 4 rows. 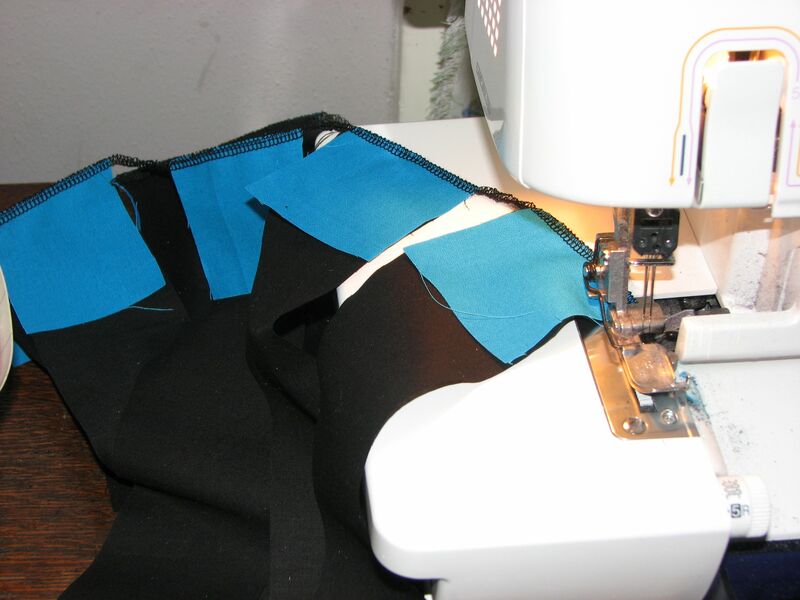 Once you have 4 rows, you’ll need to sew a black fabric strip on the left-hand side of each row. Please note that at this time, there are only black strips on the left and right of each t-shirt square. 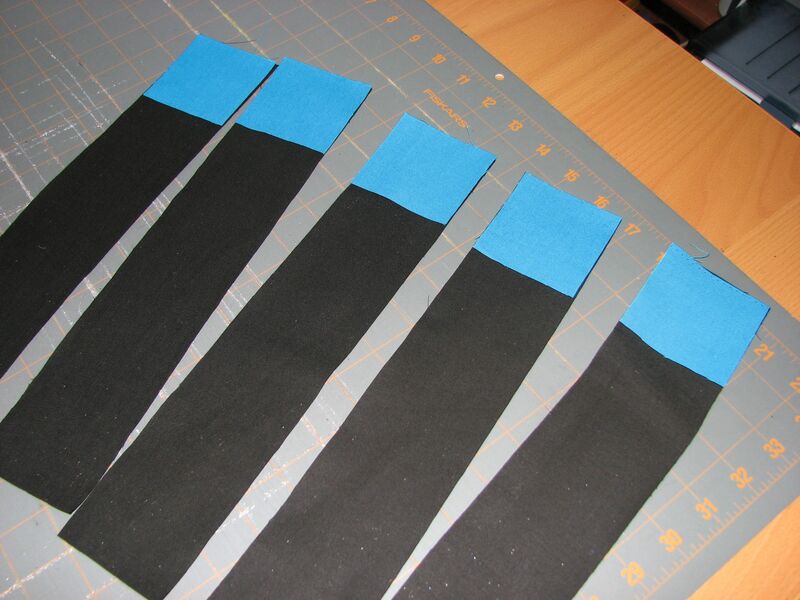 We will be adding the black strip/turquoise square rows in-between each t-shirt row as the next step. Once you have your inner strips and small squares cut out, you will need to make some “rows” for the quilt. 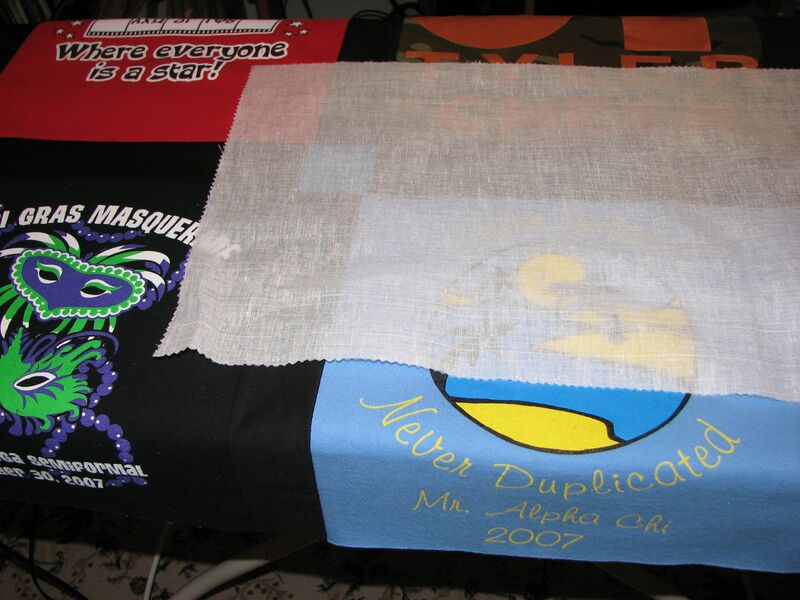 Don’t sew all of your strips and squares together, though, because you’ll need some for the t-shirt rows as well. 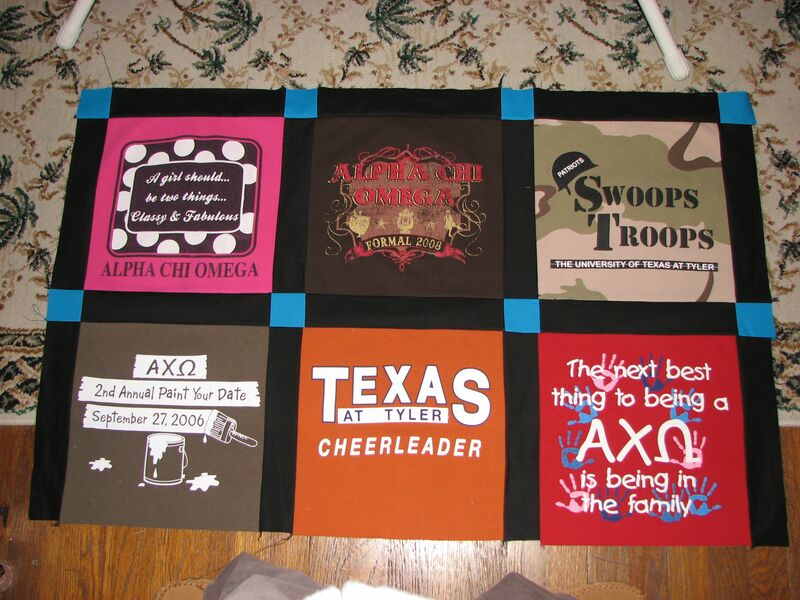 The quilt will have a alternating rows of strips/squares and strips/t-shirt squares. The above picture shows me serging strips and squares together. I love using a serger for quilting, because it cleans up edges so nicely. 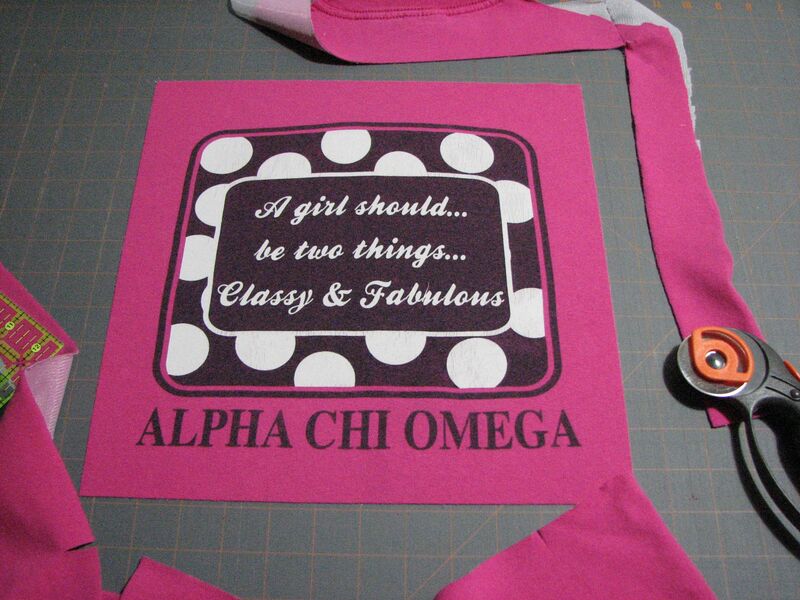 After you have prepared the t-shirt squares, you’ll need to cut inner border strips and small squares. I used turquoise fabric to make 2.5 x 2.5 small squares. First, cut strips of fabric that are 2.5 in. wide. 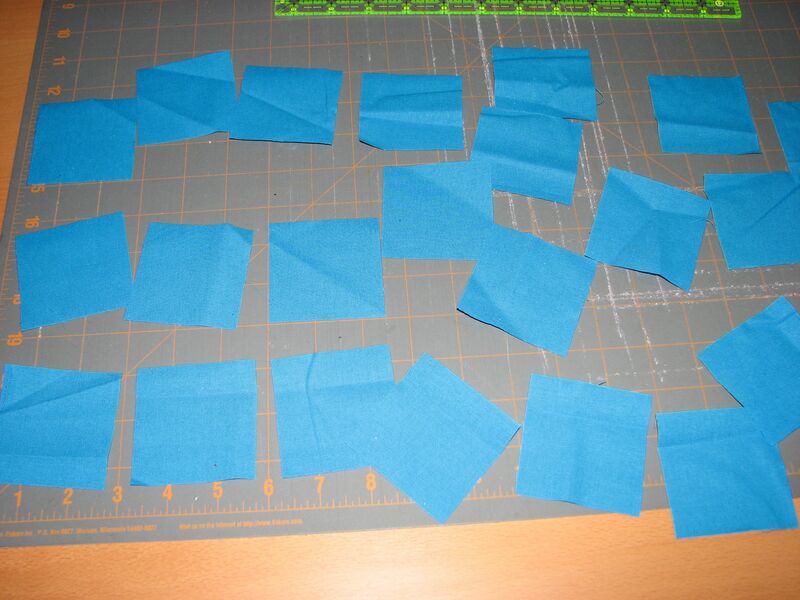 Then, trim the strips to be 2.5 x 2.5 inch squares. The above picture shows the small squares. After you have cut out your small squares, you will need to cut out your inner border strips. I used a black fabric for these. First, cut strips of fabric that are 2.5 inches wide. Then, cut the strips 12.5 inches long. The 12.5 x 12.5 square ruler really comes in handy for this. 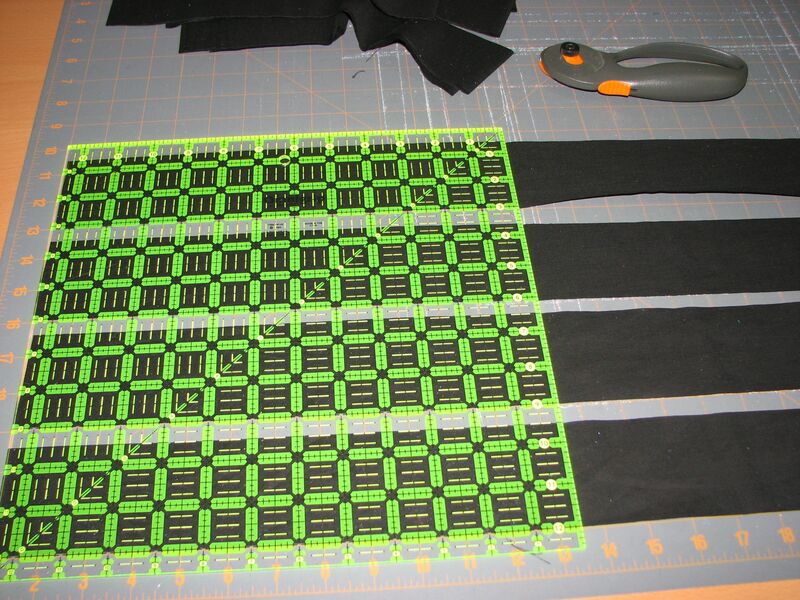 The black strips are 12.5 inches long in order to be as long as each side of the 12.5 x 12.5 inch t-shirt squares. I chose 2.5 inches for the width, although you could increase or decrease it. Since the black strips are 2.5 inches wide, the small squares need to be 2.5 x 2.5 inches square. 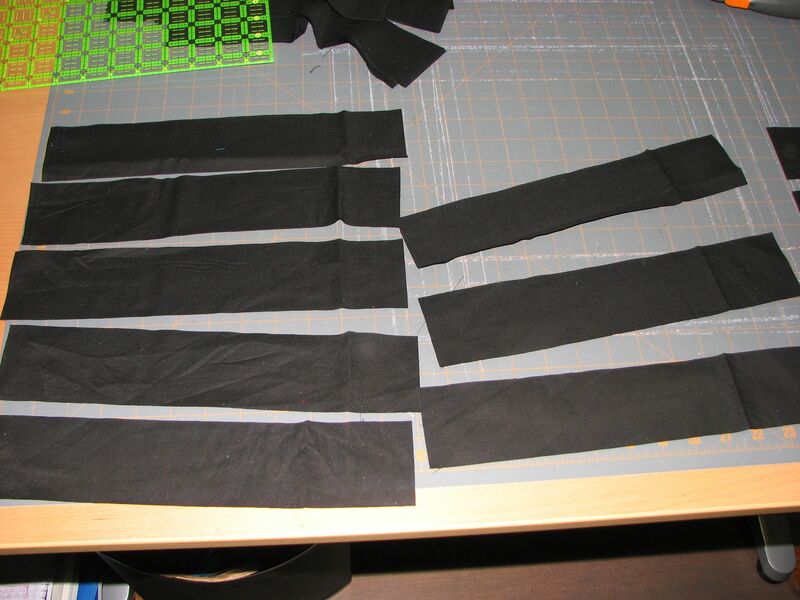 The above picture shows the 12.5 x 2.5 inch strips of black fabric that will be used for the inner borders of the quilt. Once you have the interfacing fused to the back of each shirt piece, it’s time to cut squares out of each shirt. I used a 12.5 x 12.5 square quilting ruler. It’s well worth the purchase, although I suggest waiting for your fabric store to have a sale or offer coupons. I know that I’ll continue to use this ruler for many quilts down the road, so it’s a great tool to have. 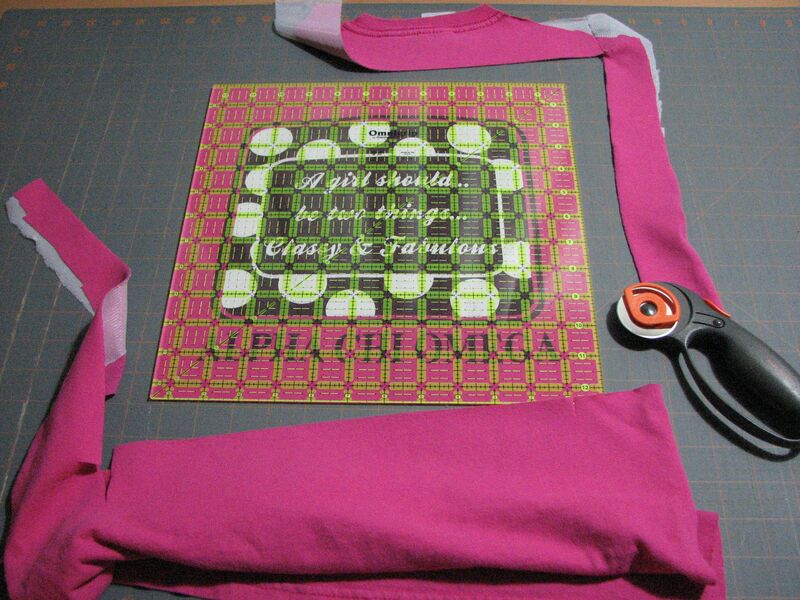 Above is a picture of what a shirt square looked like after it had been trimmed. 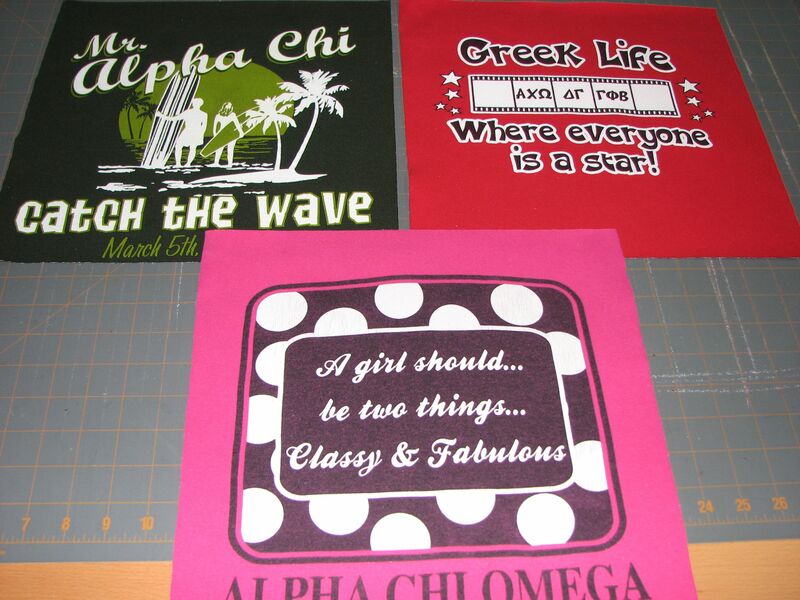 Above are three shirts after they had been cut into squares. 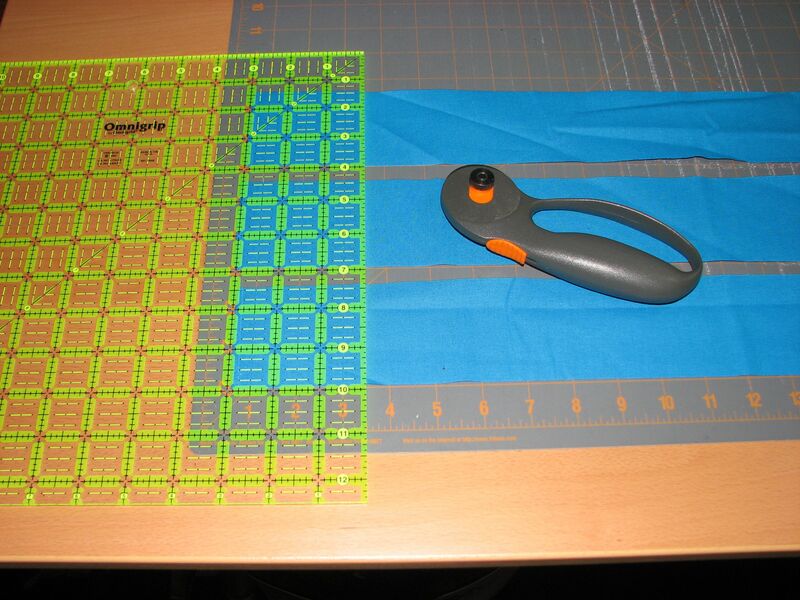 You will have twelve 12.5 x 12.5 t-shirt squares after this step.